Great Britain’s Emma Pallant entered the multisport world after a serious knee injury permanently sidelined her middle-distance running career. Since 2012, the speedy runner has garnered a shelf-full of reassurances that she made the right switch, including two World Duathlon titles in 2015 and 2016, a World Aquathlon title in 2017, and three long-distance triathlon titles so far this year. 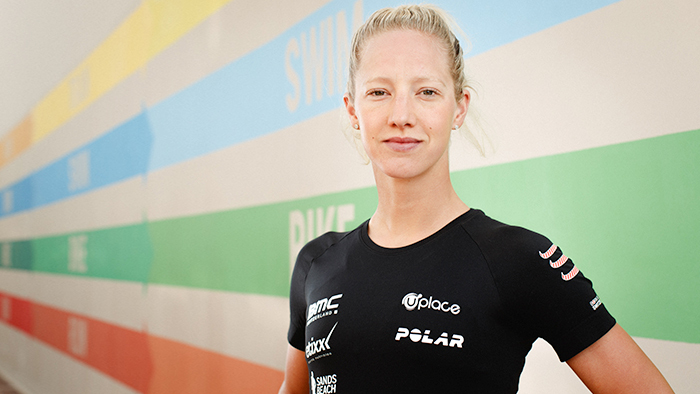 We sat down with the BMC-Etixx Pro Triathlon Team member to learn about her journey from track to triathlon, her coaching career, and why the 70.3 distance suits her so well. You started as a track athlete. What made you make the switch to triathlon? Yeah I was a 1500m and generally a middle-distance runner. I had a bad knee injury and had surgery, which sidelined me for a while. However, I came back to track for a couple of years and had to go up in distance as the result of my injury, which meant I had to train differently. Honestly it was frustrating because my competitors would be able to do so much more mileage than I could, so I started to feel like maybe it was the end. My knee flared up again eventually, and it was devastating. I was fortunate because British track star Kelly Holmes was my mentor at the time and she got me into the triathlon. At the time I was already doing a lot of swim and bike training so she told me to give it a go. I contacted coach and former Olympic triathlete Michelle Dillon because I knew she was a good coach, but I wasn’t sure if she would take me on. But she went for it. And I never looked back. Your running prowess definitely propelled you quickly in the ITU world, but how did your training and racing strategy need to change once you started non-drafting, long-distance racing? Because I was coached by Michelle and not British Triathlon, it made it hard for me to get into all the right ITU races. So I didn’t do a huge number of draft-legal triathlon races. You can only get better at the swim by doing those types of races, so I decided to be proactive about it all and I first got into duathlon and had a lot of success there. Then last year I entered 70.3 racing. It went from swim, swim swim to all about the bike. So it was a huge shift in total training hours. It’s also a very different style of riding, so it went from bursts of speed and breakaways to a more time-trial mentality and a constant push. I prefer biking to swimming and I prefer to go hard from the start rather than thinking about tactics—so it’s worked out pretty well so far. How does being part of a triathlon team like BMC-Etixx help you with your overall performance? The sponsors have been awesome, and the backing that the team has is so important. Being new to the sport, it’s really hard to get in touch with those sponsors. Without being a part of the team, it would’ve been much, much harder to get the support that I have been given, and it’s made all the difference in my career. And being around the team has been huge. I’ve learned so much from them. We have specific camps together, but you always keep in contact with each other and if my coach can’t come to a race, they are always there for that support. We had one camp in Mallorca and one in Lanzarote so far this year, and they were just great. How does the run pacing in IRONMAN 70.3 races compare to the pace of short-distance racing? Does it surprise you how fast some of the women can run for long periods of time or does it seem more relaxed to you? I’m always chasing no matter what—the swim and the bike are my weakest. So I try to be as aggressive as possible, and if I hear that I’m four or five minutes down in T2—then I’m excited. I tend to go quite hard and then just plan on making it as painful as possible. I know how to hurt myself, and honestly I get excited about that. I like to do it, crazy as it sounds. With about 5K to go on the bike, that’s when I get excited about the rest of the day. Did you have to make a lot of nutrition changes to your routine once you entered the world of triathlon as opposed to running? Nutrition really is the fourth discipline of triathlon, and I just had no clue. Before I joined BMC, I was still fueling like a track runner, so our sports director Ben DeWolf sat down with me and told me I had to eat more. He said I had to stop thinking like a runner and start paying more attention to my hydration, not just during a race but every day. When I started racing duathlons and triathlons, I didn’t want to take the time to drink, and I paid for it. Once I changed that habit it really changed my performance level. As a runner I was always thinking about racing light, so I trained heavier and then came down in weight for a race. I wasn’t ever thinking about muscle mass. I wanted to be light and springy. When I started going on these large group rides, I thought everyone was so greedy with their picnics in their back pockets! Well, all it took was a few total bonks for me to learn the error of my ways there! I’ve also had a lot of gut issues as a runner, many of them related to extreme diets that weren’t the most healthy. Plus in running races, fueling during the race was just never something I had to think about. Now it’s something I constantly have to think about and plan for. In general, I have to be careful of the timing of when I eat when I’m training and racing. And I sweat quite a lot, so if I take something in I have to make sure I have a ton of water with it. I have been known to shove the old gummies down when I need to though—but hydration is key for me. Check out our pre-race Facebook Live with Emma Pallant days before she finished second place at the 2017 IRONMAN 70.3 World Championship.